Located at a distance of 650 light years, the mysterious planet orbits around its Sun (KELT-9) leaving behind a ghostly tail similar to a comet. The planet lacks the revolution movement. This means one part of the planet is facing extreme radiation, and the other part is on a continuous night. 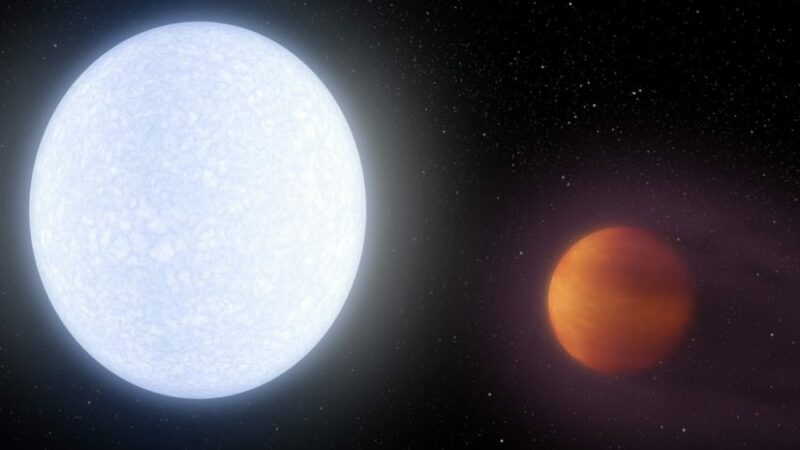 The bright side of the planet, which is three times bigger than Jupiter, reaches a temperature of 4.300 degrees Celsius, being 2.000 degrees colder than our Sun. Popular Science notes that the center of the planet is not hot enough to produce the reactions needed to form a star. The tail of the planet resembles that of a comet, but it is formed only by gas and is due to very high temperatures. There is no chance that there will be molecules of water and methane. In the past, it is very possible that the planet has been violently involved in an impact with another astral object, too. We can observe this on the strange orbit that the planet has. KELT-9b could become a rock due to its climate, it could explode, or even worse, it could evaporate. In the near future, researchers will analyze both parts of the planet. It is believed that the cold side might be heated by strong winds, but more observations are needed.